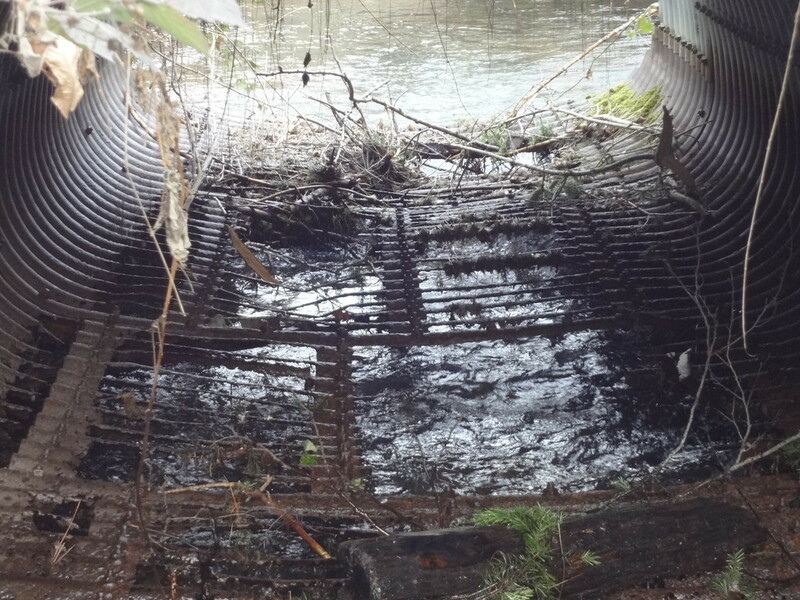 The Applegate Partnership & Watershed Council (APWC) is working to update our database of fish passage barriers for juvenile and adult salmonids, lamprey, and resident trout. We have recently completed an update on the Thompson, Slate, and Humbug drainages, please see 2014 Barrier Project Reports & Data. 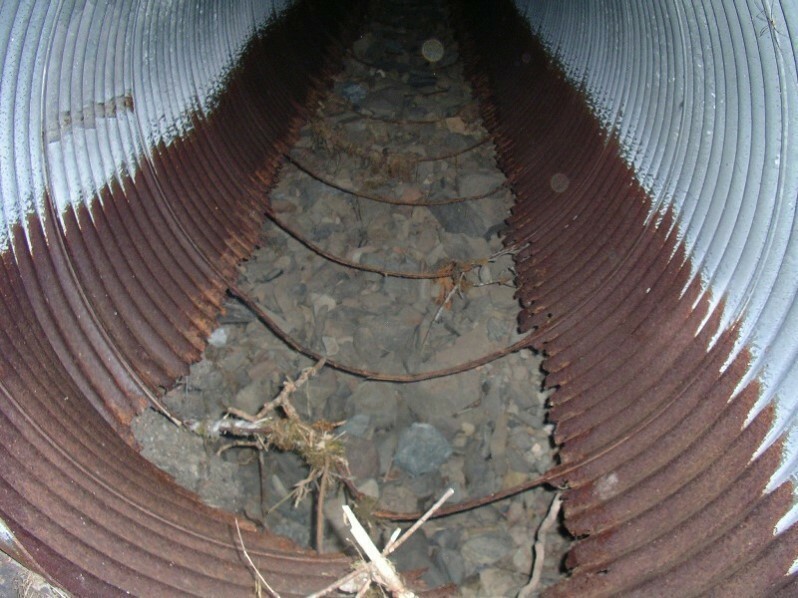 Barriers can include anything that could impede the migration of these species up and down the stream, such as culverts, dams, and even natural features. The original database was created in the late 1990’s by the Rogue Basin Coordinating Council and we would like assess their current state, as in many cases, conditions have changed. From this information we will develop an action plan to prioritize potential projects to remedy barrier issues. This project could lead to benefits for landowners and the community such as infrastructure improvements, irrigation improvement and efficiency projects, fishway installation, and habitat restoration. 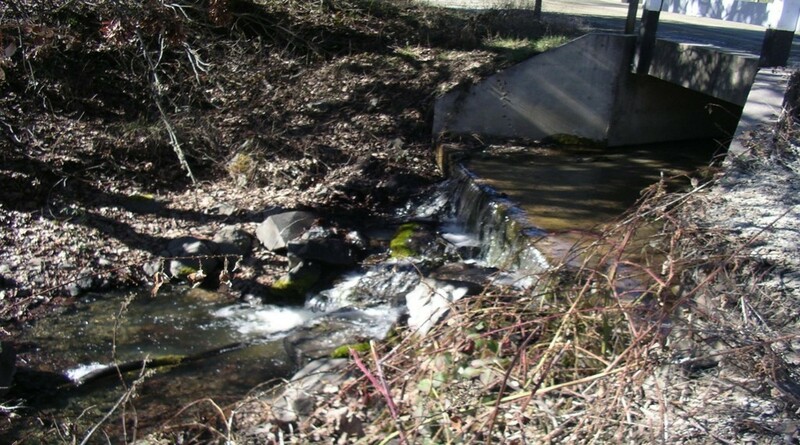 An example of a potential project that could come out of this assessment would be replacement of a culvert, such as Butcherknife Creek culvert (see above photo). 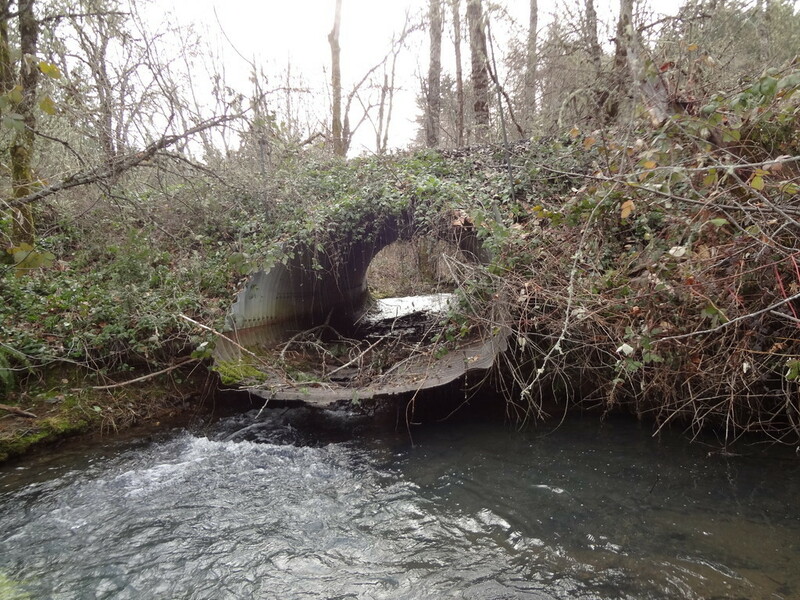 This large, metal arch culvert is located on Butcherknife Creek, a tributary of Slate Creek. That road provides the main access for Butcherknife Creek and Onion Mountain Road. The bottom has rusted completely, giving it the appearance of a “cheese grater”. This condition can do extreme harm to aquatic species moving up and down the creek, but even more importantly, it has greatly compromised the integrity of the culvert and road making it a hazard to the residents who have to cross it daily. 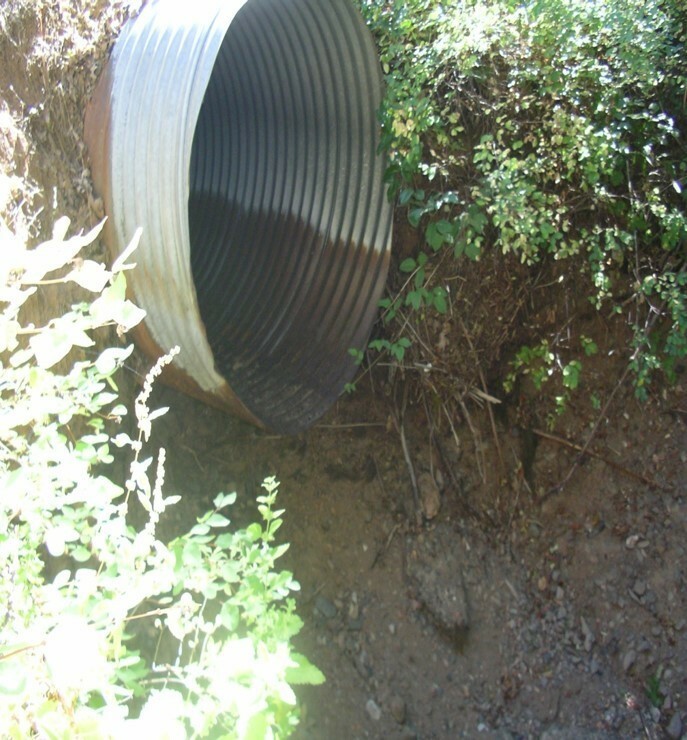 We are currently working to secure funding to replace this culvert. Let's Work Together! We Can Help. Do you have a potential fish passage barrier or other natural resource issues on your property? We hope to develop a relationship with local residents that will result in mutually beneficial projects that improve safety conditions for residents, increase irrigation efficiency, reduce maintenance to instream irrigation controls, reduce road maintenance, replace culverts, reduce erosion, improve fish and wildlife habitat, and increase property values. If you are interested in participating in this program we will need to permission for our team please contact us or fill out an access agreement and send it to us. 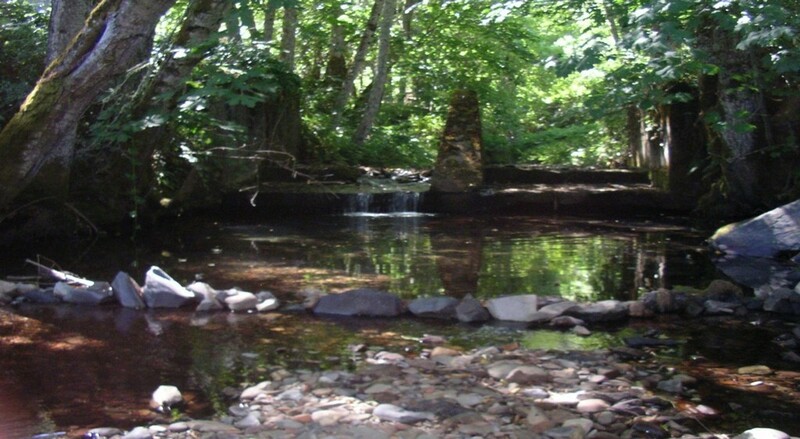 We are available to assist you in in-stream and riparian habitat restoration and consultation. Please see our example assessment form. We have the resources to help you. Funding assistance is attainable but it takes time to come to fruition. Let’s get started! If you have any questions, ideas, or have a potential barrier on your property that is not used anymore or one that might need improvement, please contact us. This blank form will be used during our fish passage barrier field assessment. On hold until further notice. The first and foremost goal of our non-profit organization is to work collaboratively to improve the well-being of the Applegate watershed from ridge top to ridge top. Have you ever thought about how much your skills and time could contribute to your community just by volunteering? Become a member.